Carli Lloyd scores a brace and bags an assist. 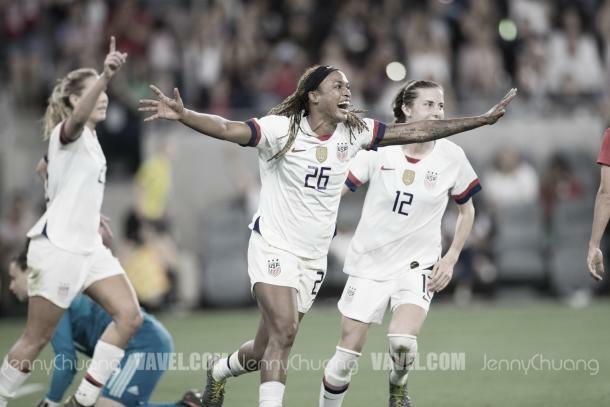 In a match where the United States Women’s National Team controlled the game from start to finish, creating a plethora of chances they secured a 6-0 victory against Belgium late Sunday night in Los Angeles. This marked the first ever meeting between the two nations. Goals came from a Carli Lloyd brace, Lindsey Horan, Samantha Mewis, Alex Morgan and Jessica McDonald. It seems that Carli Lloyd has been deemed as a player who will come off the bench during the World Cup but that did not stop her from proving that she still has more to offer this team. Lloyd got the scoring started with a 10th minute header, the goal came off of a free kick. Just six minutes later in the 20th minute she would net another header to record the 107th goal in her national team career. In the second half Lloyd capped off her impressive performance with an assist off a cheeky through ball that split two defenders on the way to Alex Morgan who finished it into the back of the net. She also went the full 90 in the match for the first time this year. Five of the six goals scored tonight came off of headers and four of the six set pieces. Christen Press picked up three assists from the set piece goals. It was obvious after the first goal that Belgium would not be able to contest with the U.S. in the air and they paid the price for it. "I don't think we ever doubt our potential on this team and I think if we play to the best of our abilities we are going to score a lot of goals," said Press. Ellis made six changes to her starting lineup tonight from the game against Australia including switching up the entire backline except for Becky Sauerbrunn at center-back. The biggest change that Ellis made in the starting lineup for this game was the inclusion of Ali Krieger. Krieger returned to the national team for the first time since 2017 to earn her 99th cap. 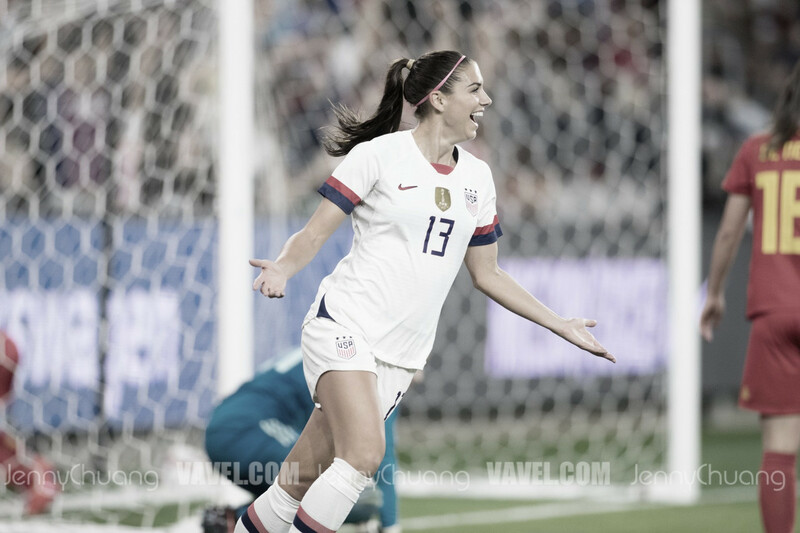 She had a good outing at right back but was playing against a team that did not really show a lot of attacking power against the superior U.S. team. Julie Ertz was pushed back into a center-back position sliding Tierna Davidson over to left back, a less familiar position for the youngster. With Davidson at left back that pushed Crystal Dunn into the midfield where she is arguably more comfortable. Overall the USWNT put together a good showing against a lower quality team in Belgium and came away with an important win against Australia just three days ago. The team still has some improvements to be made but they look to be on stride to putting on a good showcase in France. The next match for the USWNT will be May 12 against South Africa, part of the World Cup Send-Off Series. SCORE: 1-0, Min. 14, Lloyd. 2-0, Min. 20, Lloyd. 3-0, Min. 26, Horan. 4-0, Min. 33, Mewis. 5-0, Min. 51, Morgan. 6-0, Min. 90+1, McDonald.